After a fine and inexpensive day hitting the lifts at Timberline (see TAY report), Corey Bloom and I drove down to Shasta to meet up with a big gang of TAY folks from Seattle. We slept Friday night at Bunny Flat trailhead to acclimatize, and then drove into town, unexpectedly meeting the others (Allyson, Chris, Cinnamon, Jessica, Justin, Kam, Kelvin) who had just arrived at the ranger station, followed by a fine breakfast at the Black Bear Diner where Kevin joined us from the Bay Area. We all drove up the Castle Lake road on the opposite side of the valley to take some great photos of the SW side of Shasta with Black Butte at left and a lenticular cloud in between (see also a zoomed telephoto panorama of the upper mountain with various features marked, 1600 or 3200 pixels wide). Finally we drove back to Bunny Flat and late in the afternoon we skinned up to Horse Camp to camp for the night. Allyson's TAY report has most of the details, so I'll only provide info about specific differences of our Sunday ski ascent/descent. Corey and I were feeling a bit lazy Sunday morning, so we slept in late and finally skinned up from Horse Camp at 7 AM, about an hour after the others had left. We finally met up with them at 8:30 at 9400 ft, when they had just about decided to turn around and ski back to camp due to howling winds, increasing snowfall, and impending whiteout. Corey and I decided instead to hang out and dig a snow shelter, which quickly got us below the winds. We had borrowed Kam's stove and a radio from the group, so we could melt water if stranded in an emergency and also maintain contact with Base Camp. We relaxed and waited, warm and dry in the shelter, until finally the skies cleared after 10 AM. Kam radioed up to report that they were enduring cold rain at Base Camp, while I replied that we were basking in warm sunshine (I don't think they quite believed me, but the photos don't lie!). Soon we were leaving the snow shelter and again skinning up the Gulch, arriving at 10400 ft Helen Lake to eat a leisurely lunch, protected from the continuing breezy wind by a recently vacated tent site with snow walls. A ranger dropped by to check our permits (we had purchased annual passes the previous day) and then we continued up the Gulch, eventually reaching 11400 ft. Here the snow became just a bit too firm for easy skinning and we put the skis on the pack, cramponing up a nice partially snow-filled boot pack we discovered. By 12000 ft, it was becoming pointless to go any higher, the snow was still frozen at 2 PM and every descending climber we talked to reported turning around at or above Red Banks due to very strong winds. 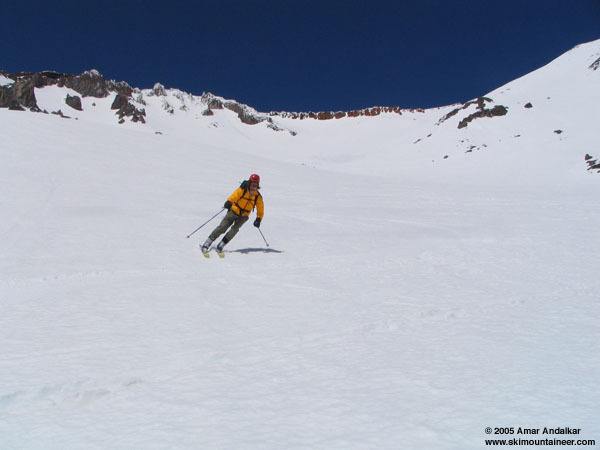 Having summited Shasta before, we had no desire to fight the winds. It was time to ski. A pair of skiers descended past us as we got ready, but we didn't find out how high they had skied from. The snow was still frozen at first, but within a few hundred feet softened into excellent corn, especially farther to skier's right on the more south-facing aspect. We enjoyed a fine ski run down to Helen Lake, then dropped back into the fog and whiteout which felt like being in a moist tropical oven due to the filtered sunshine (skiing back past our shelter in the fog). We dropped below the cloud deck by 9000 ft and temps rapidly cooled, becoming almost cold and clammy by the time we skied back to camp around 3:30 PM. Eventually the rest of the group arrived from skiing lower Casaval Ridge and we broke camp and zipped down the smooth and fast ski trail to Bunny Flat, then drove down to town for Mexican food. Afterwards, the rest of the group headed back to Seattle, but Corey and I drove back up to Bunny Flat, planning to ski Shastina the next day. Corey rips the corn in Avalanche Gulch. Click here for an enlarged version of this photo. You tell a fine tale. Nice to ski with you some out there. Glad your trip on Shastina was every bit as good as the weather promised.